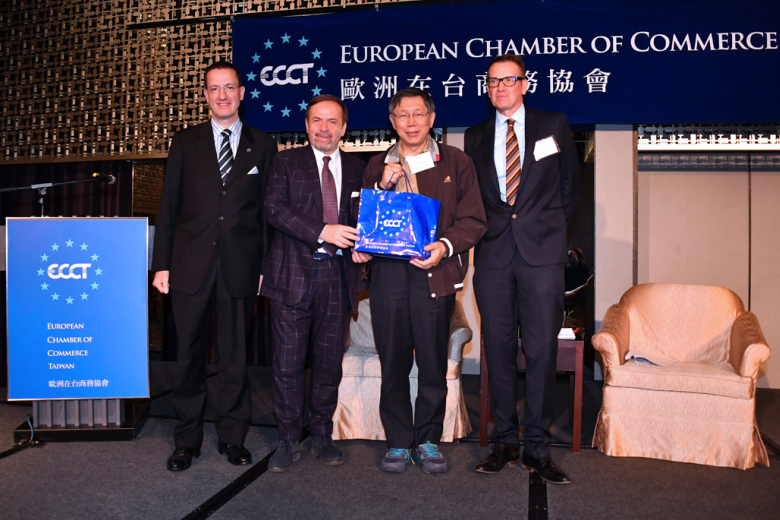 The ECCT held its annual round table Premium Event lunch with Taipei Mayor Ko Wen-je and senior officials from the Taipei City Government (TCG). 2019 marked the 21st year since the ECCT held its first annual round table lunch with the TCG. As in previous years, this year's event provided an opportunity for ECCT members to discuss issues of concern or mutual interest with the mayor and the full delegation of senior TCG cabinet officials who were seated at different tables among members at the venue. At the event Mayor Ko gave a short speech after which he participated in a Q&A session in which he answered questions from members that was moderated by Tim Berge, Co-Chair of the ECCT’s Better Living committee. Commenting on his recent trip to the United States, the mayor said that while Taiwan is an advanced country, there is still much to learn from other countries, which was the purpose of his trip the United States this year and his trip to Europe last year. During the Q&A Mayor Ko answered some of the questions directly and asked members of his administration to answer others. Several of the questions were related to equal treatment of foreign residents in Taiwan. For example, foreign residents are not entitled to electric vehicle subsidies while senior foreign residents are not eligible for discounts on public transport, even though they pay the same tax rates as Taiwan nationals. Moreover, while foreigners may get access to senior care services, they are not entitled to subsidies that are offered to Taiwan nationals. Another subject discussed was English translations of public procurement tenders. It was reported that tenders worth over NT$210 million are translated into English. In addition, to give foreign contractors more time to prepare bids, the standard tender period has been extended from 28 to 40 days. The city is also moving towards favouring “most advantageous bids” over lowest price bids by giving a higher weighting to quality aspects of bids than was the previous practice. At the conclusion of the Q&A session Mayor Ko reiterated his commitment to resolving issues important to ECCT members by setting up a contact window between the ECCT and his office and agreeing to arrange follow-up meetings to discuss issues of concern.